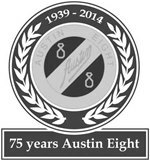 Below you will find a selection of Austin Eight Articles. 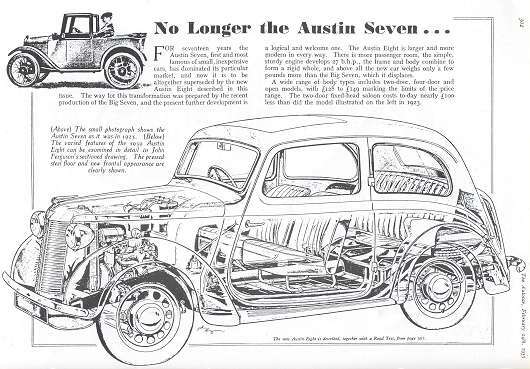 Here you will find a beautiful article called "building the Austin Eight" with nice factory pictures. 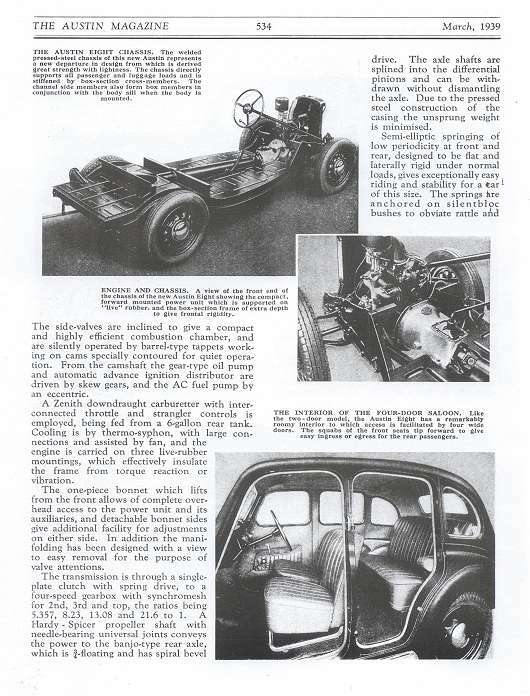 Click on the image to download the article in larger format. 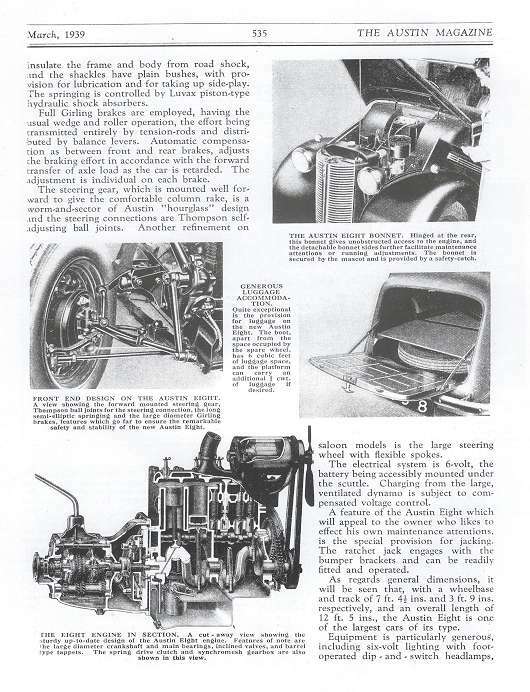 This article was published in "The Motor", February 28, 1939. 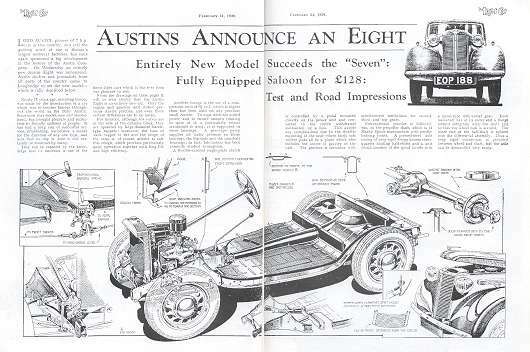 Below you will find an article about the announcement of the Austin 8. 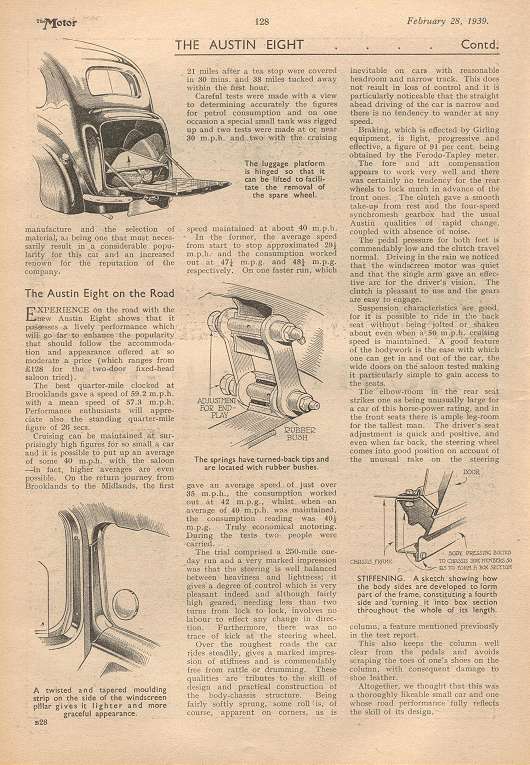 This article was published in The Light Car, dated February 24, 1939. 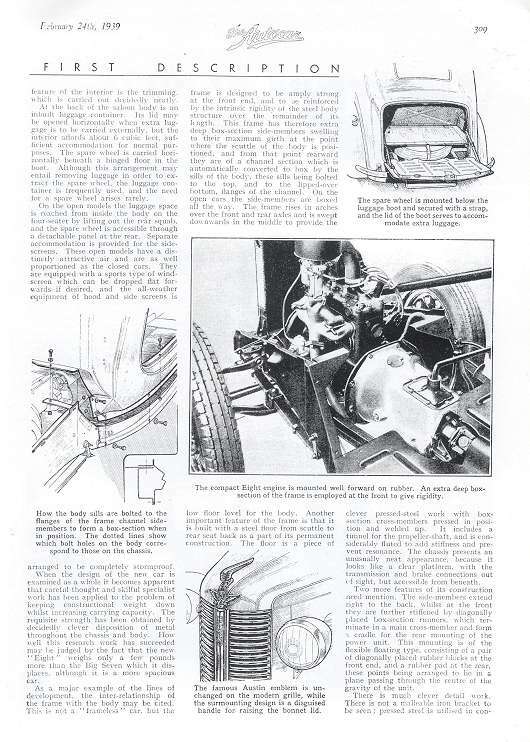 Click on the images for a more detailed view. 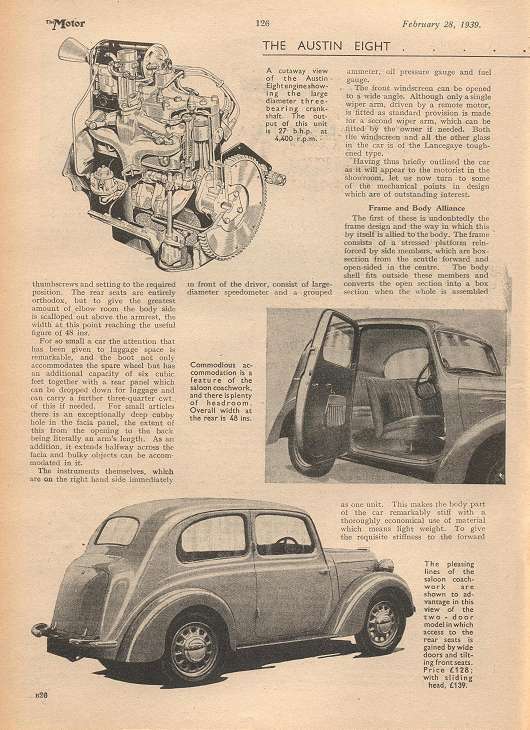 Below you will find an article about the Austin Eight replacing the Austin Seven, which was published in the February 24, issue of in The Autocar 1939. 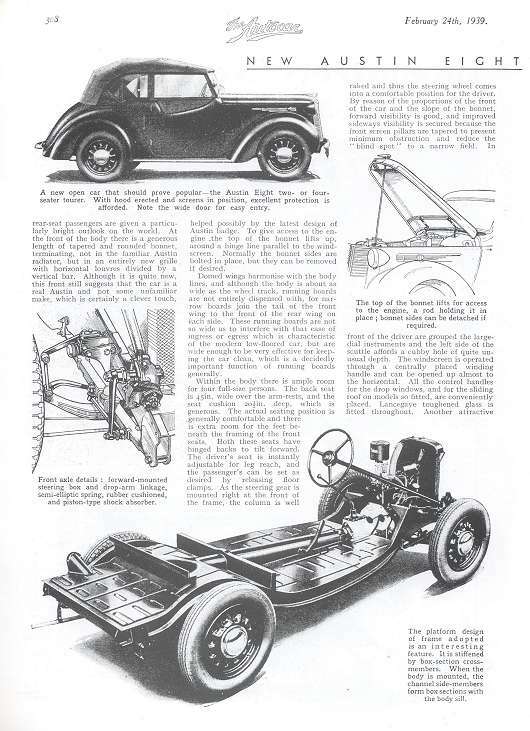 Click on the image for a more detailed scan. 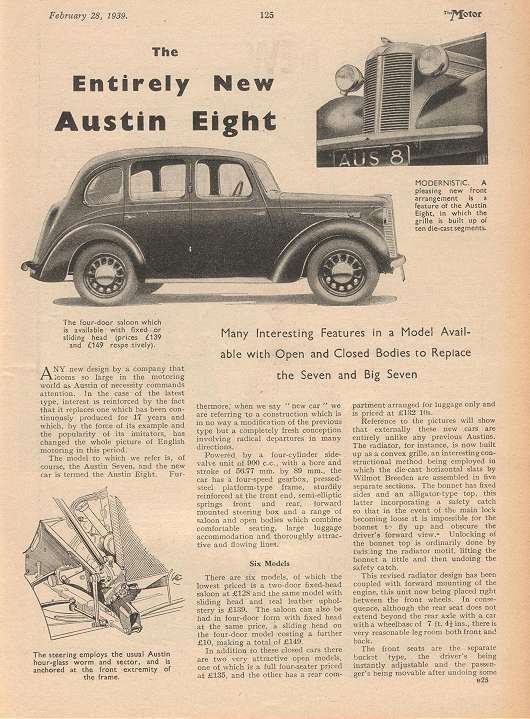 Below you will find an article about the introduction of the Austin Eight as published in The Motor, February 28, 1939. 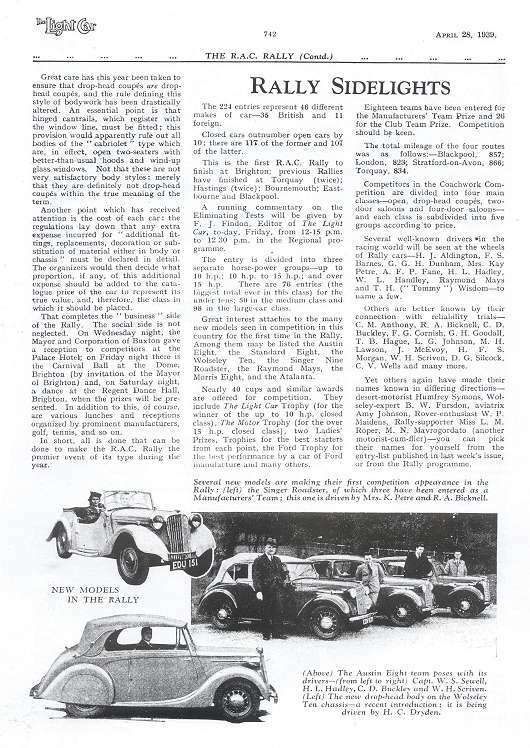 In this issue of The Motor the Austin Eight was introduced. 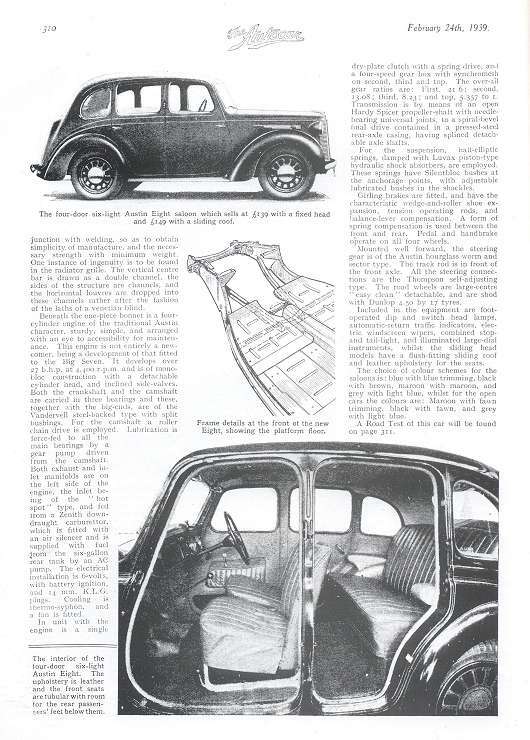 Below you will find an article about the introduction of the Austin Eight as published in The Autocar, February 24, 1939. 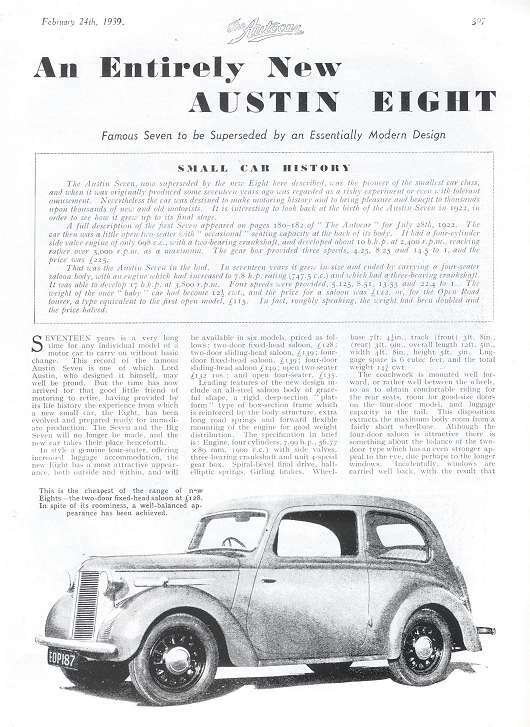 In this issue of The Autocar the Austin Eight was introduced. 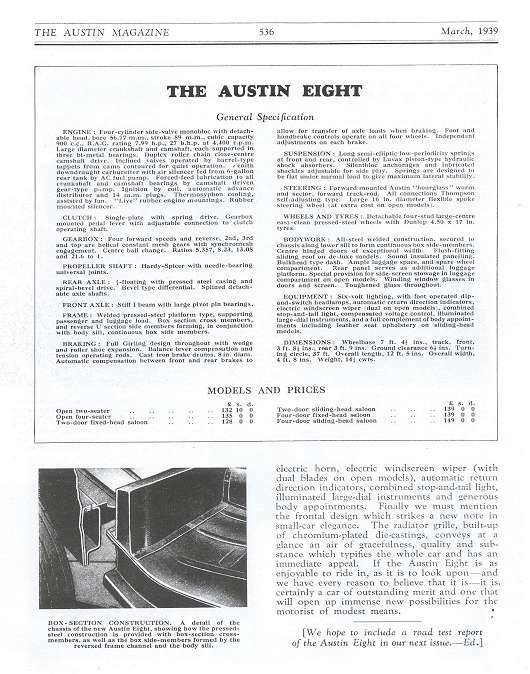 Here you will find an article as published in the Austin Magazine of March 1939, introducing the Austin Eight. 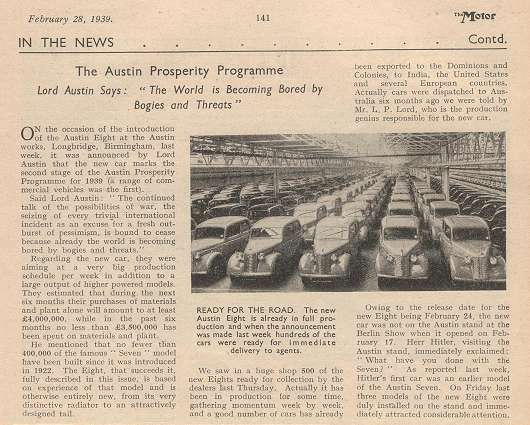 Below an article about the Austin prosperity programme 1939, as published in The Motor, February 28, 1939. 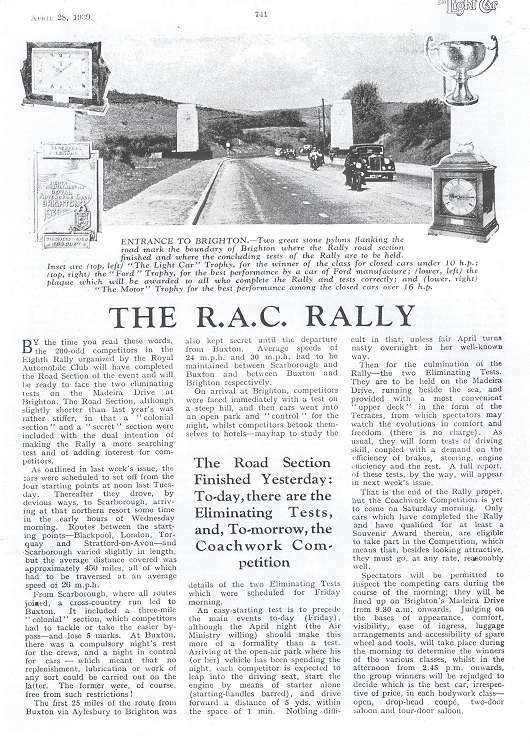 In this paragraph an article about the R.A.C. 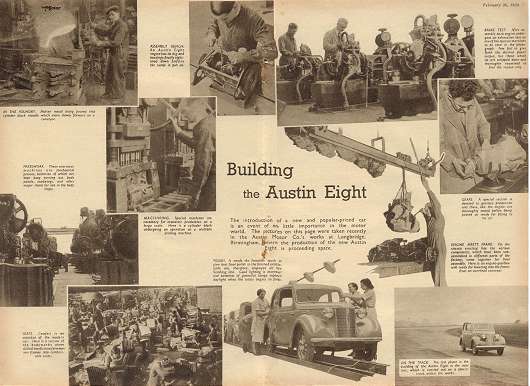 Rally, in which also Austin Eights took part. 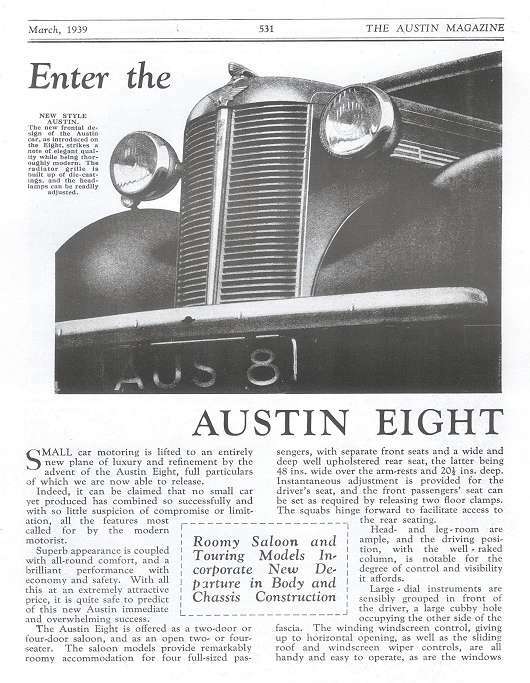 This is an Australian reprint of the 1939 Austin Wasp, which was the Australian name for the Austin Eight. 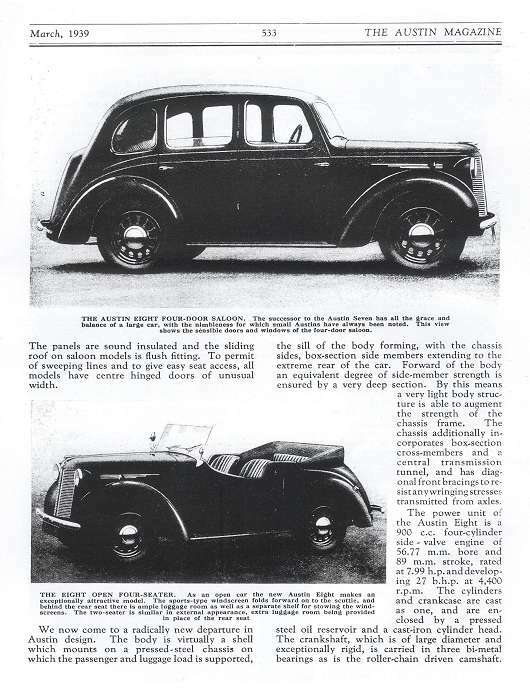 This reprint is an original dealer hand out, reprinted from the "Sidney Morning Herald" May 19, 1939, by John Fairfax & Sons, Sidney Australia. 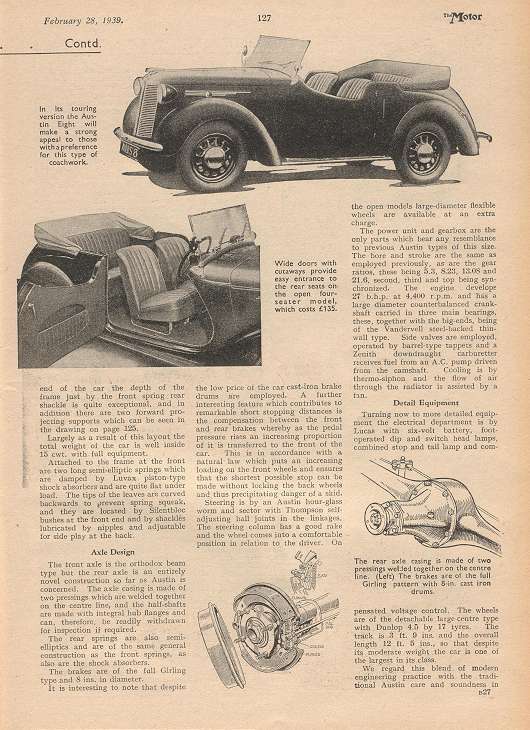 Here you will find an article about used cars on the road, published in 1952. 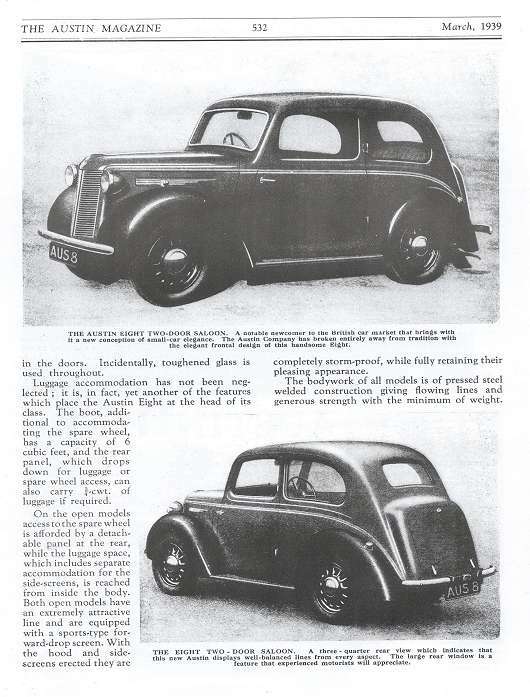 The Austin Eight was in 1952 second hand more expensive as the new price in 1939.